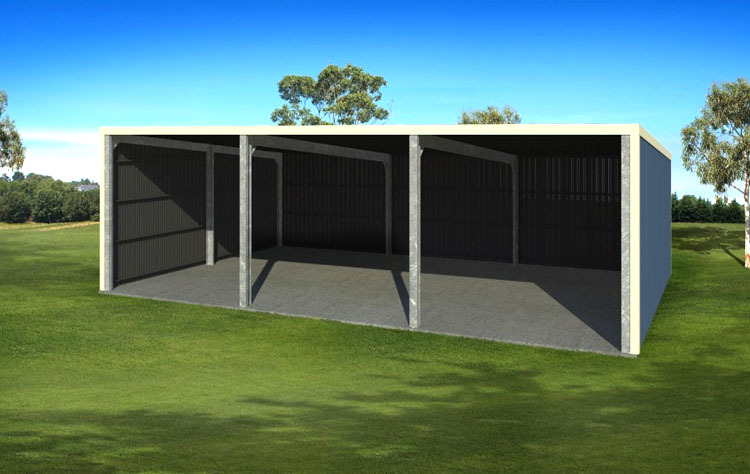 Machinery Farm Sheds, or as they are more commonly known as Open Sided Sheds make the perfect shelter for implements, hay storage, packaging, workshops and more. They offer side weather protection on three sides and are cool to work under. Openings at the open side can provided up to 12m (40′) to drive the widest of wide farm implements with safety and security. 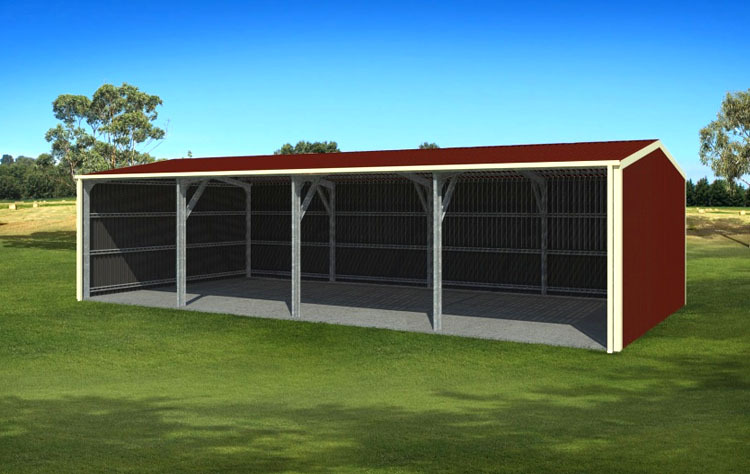 Machinery Farm Sheds provide an inexpensive solution to protect your valuables. 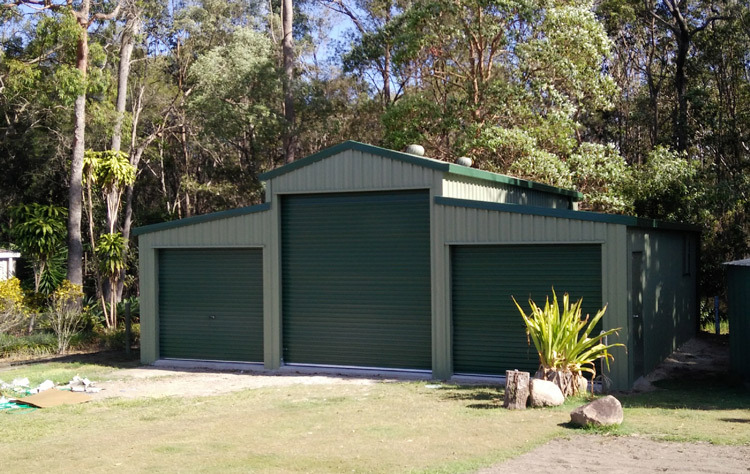 Skillion Farm Sheds have been around for a long time and there has been a recent resurgence in their use. Their aesthetic design truly add style to building. At MyKit Farm Shed we tailor make your Shed to suit your exact needs. This means that if you ever need to add a bay, you simply remove the wall and connect the extension. Its that easy, because we engineer, design and build them. 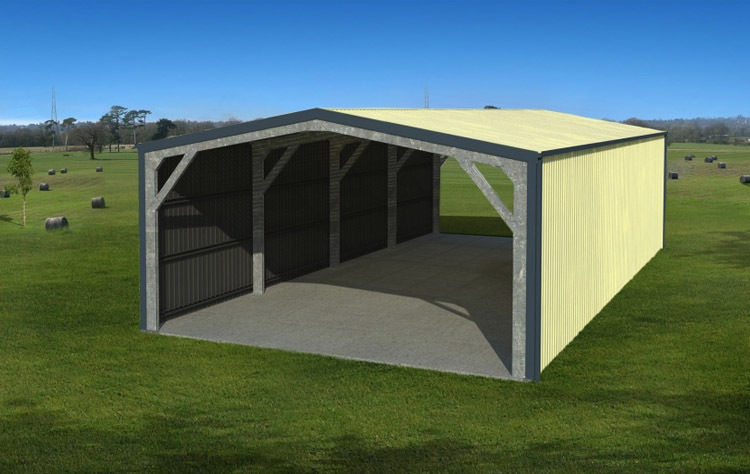 Whilst we display a select few fully enclosed Sheds on this site it is important to note that we can design virtually any Shed for any purpose you may need. You can have sliding doors, rolling doors, personal entry door or sliding glass doors. Roof vents, roof skylights windows and insulation, awnings, eaves or mezzanine floors. We design it, we engineer it, and we supply it. 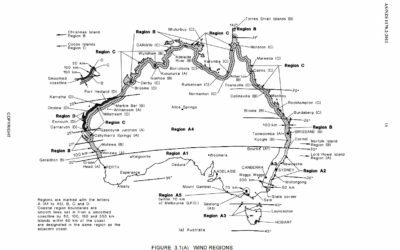 Whatever your needs, in any area of Australia be it Region A, B or C, if it’s a shed made from high tensile C section…. 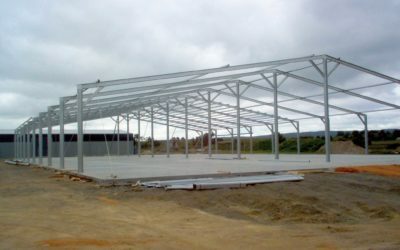 we can do it to your specific needs, be it with, height, length, bay spacing or roof pitch. 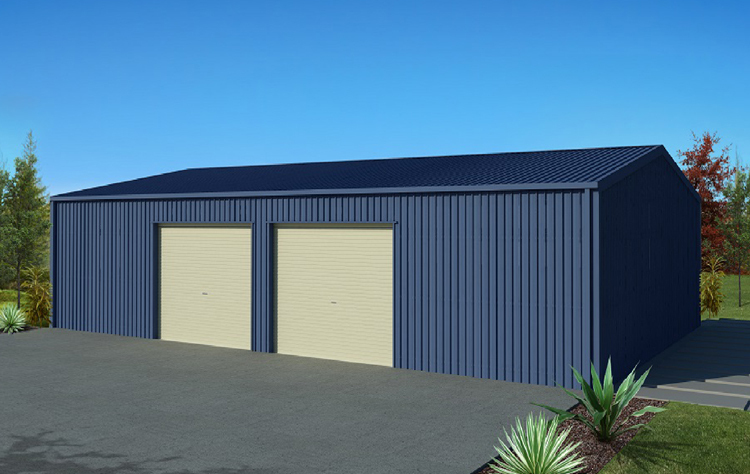 An Open Sided Farm Shed or also known as a Roof Only Farm Shed has multiple purposes for the Australian farming terrain. 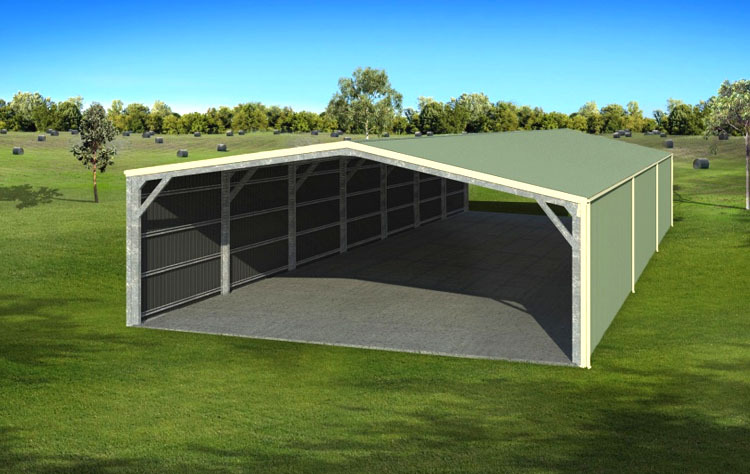 Used for as hay sheds, cattle shelters or simply a place to park your tractor, an Open Sided Farm Sheds can be delivered with your choice of footing connection and can be constructed with or without a slab. We can supply footing brackets that can be cast into a concrete footing so that the Shed can be simply unbolted and moved to another site or we can supply extra length columns to cast straight into the footing at no extra cost. 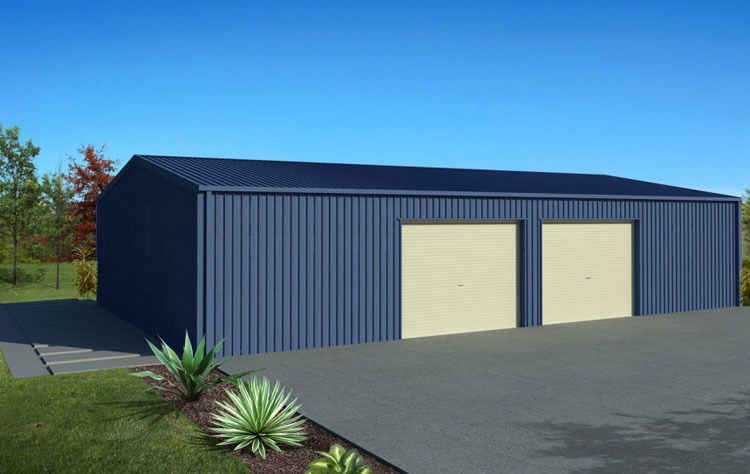 Open Ended Farm Sheds or Drive Through Farm Shed are the ideal Shed configuration when you want to load from both ends or you don’t want to reverse large machinery out of the Shed. 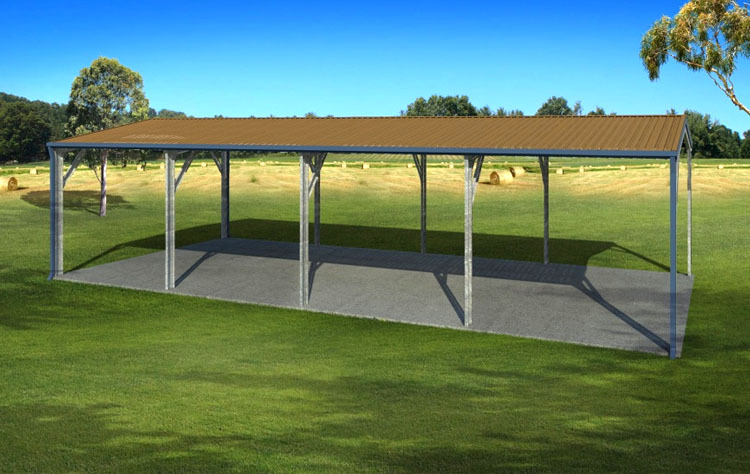 They offer side weather protection and provide a cool breeze to work under.The Open Ended Farm Shed is a large footprint highly affordable Shed. 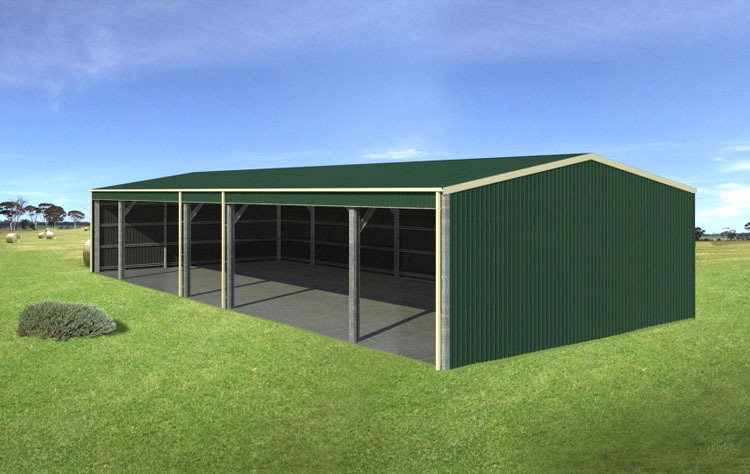 Custom designed to suit any farm or need, as with our entire farm range you can simply add another bay at any time as your needs grow. It just simply bolts on. The iconic American Barn has made its place on the Australian terrain. 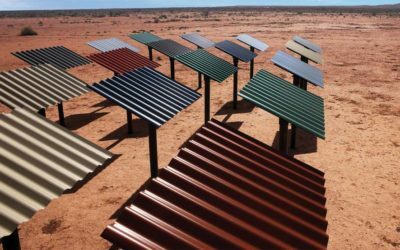 Traditionaly built in timber, the American Barn is now designed and supplied in steel to suit the harsh Australian climate. The American Barn truly is a design that never dates. 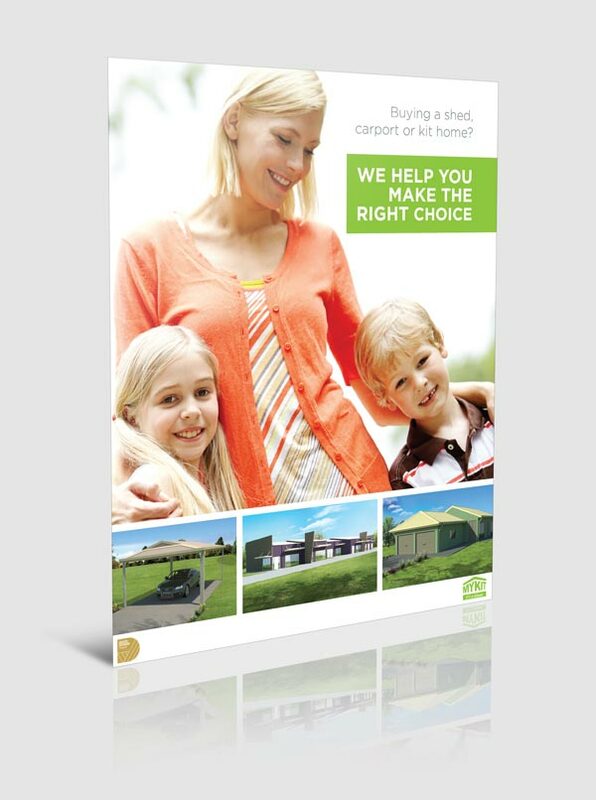 Not only does it serve the purpose of shelter for your goods, it insights epoch style to any home or rural property. 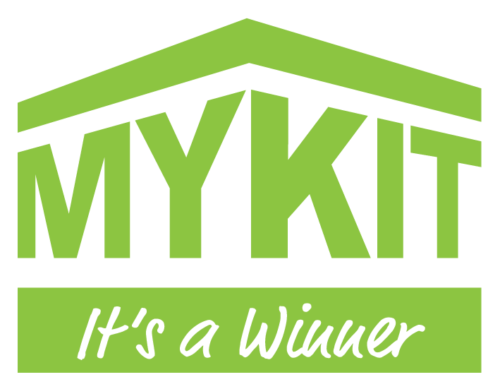 Custom engineered and designed, an American Barn from MyKit will give your home a touch of classic style that cannot be found in mainstream design.